In my case, this period gave me a chance to reflect on a recent business decision and heralded the return of our beloved online community, the Sovereign Writers Circle. Many of us have lost track of a wider sense of belonging because of our relationship and family structures, because of our demanding jobs, because wine is easier, because there are so many things tugging at our attention that seem more important than connections with soul friends. It’s time to look at our need for community, our need for sovereignty, and how the two blend together. So many of us walk around with a secret (or not so secret) yearning for some other way to be, some other kind of life to lead. This thing you yearn for, it’s not so far from who you are now. You’re not asking to join the circus or live on the moon. Instead, you want your own life, plus a little something more true, more authentically yours. A creative life. A spiritual life. An artist’s life. A writing life. Do you know how to describe the “real magic” you offer your clients? There’s a part of what you do that’s beyond, beneath, and before the bounds of language. As a healer, you know that the color, the sensation, the texture of an event or an emotion carries meaning that the English language often can’t begin to touch. This new year is breathing down our necks with the icy whisper of a frigid New York winter. On the other hand, this is a great big world with all kinds of weather… The new year just might be caressing your skin with the sweetness of a Carribean breeze. No matter what, the new year tends to bring chills of anticipation. If you’re anything like me, you’re shifting back and forth between “yes, finally!” and “no, I’m not ready!” as the sands of time drain from the 2017 hourglass… There’s all of excitement for a fresh start mingled with the worries that a new calendar won’t necessarily make for a whole new you. Do you do the “word-of-the-year” thing? We’ve just wrapped up the latest #7MagicWords Challenge, so the potency of a single word is abundantly clear right now. #7MagicWords takes place at the turn of each season, and, as this is first time we’ve run challenge in the winter, it’s the first time we could use it to help us find a word of the year. Just about every invitation to join the project included: “You can find magic in a word and it can light your way - day by day and throughout the year to come.” And as the last magic words appear in the Facebook group and on Instagram, it’s clear that the challenge fulfilled its promise for so many of the participants. The #7MagicWords Challenge is always 8 days long (because, why not?) and the eighth prompt is always the same: a word that integrates. Though I hadn’t intended my integration word to be my guiding light for 2018, it seems that it is. It has to be. You could say that every year is about writing for me, but now, as I continue to grow as a writer and as a guide for other writers, I see the word coming into fresh, undeniable focus. And, as I look at my own big, thick 2018 planner full of endless unwritten possibility, I know that I will write my way into just about every accomplishment. It’s about writing my Sovereign Story and unpacking what I really mean by my beloved motto “Free the Princess. Crown the Queen. Embrace the Wise Woman.” I know this is the story I must write and tell. It’s about writing into the fantasy novel that wants my attention and will satisfy my truest truth… I’ve always wanted to write vast sweeping stories like my favorite authors do. It’s about continuing to write the everyday-sized stories because they’re how I connect and serve and teach. And, it’s about supporting others’ writing, continuing to deepen my story healing practices and finding new ways to support healers who wish to develop their own writing practices. 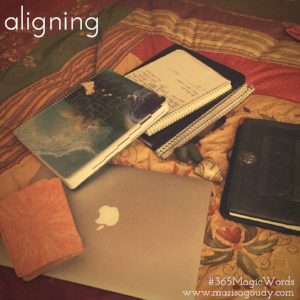 How about you… what’s your word of the year, #7MagicWords inspired or otherwise? “If you have the words, there's always a chance that you'll find the way.” One of my favorite poets, Seamus Heaney, said that. I always keep it on my desk as a reminder. Here are two words I know can help you find the most direct way to your truth and your intention: writing and community. That last item on that word-of-the-year list? That promise to support writers in new ways? That’s why I am launching the Sovereign Writers Circle on January 2. In this group of therapists, coaches, and transformation professionals, you’ll have the community encouragement to do what can feel like a very lonely thing - writing your blog, your website, your info product, or your book. Yes, we’ll think about publishing and using writing to build a business, but we’ll also focus on the healing power of writing. You’ll be invited to use the blank page to discover what it is you really want and what you truly know about your own Sovereign Story. Learn more about the group including the schedule for our 6 monthly calls and other benefits of joining the SWC. Could “writing” be your word of the year? There are new stories to tell, stories you and I have been hoarding and neglecting and allowing to wither away while we were busy striving and coping and growing and losing track of who we really are... Writing is how we find ourselves again and build the stamina to keep ourselves from losing track of what's really important now and in the future. I invite you to write with me. I promise words and magic. I promise to dive deep into the mystery, to help you find the stories that hide within and write the stories that must be shared.